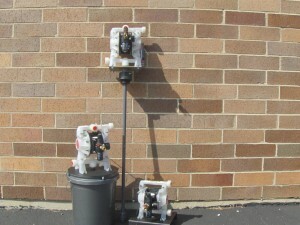 Milton Roy PVC and stainless metering pumps mounted on non-metallic fiberglass base for severely corrosive environment. 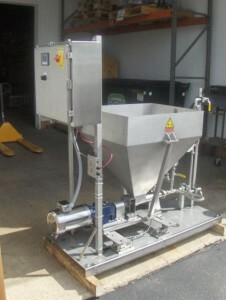 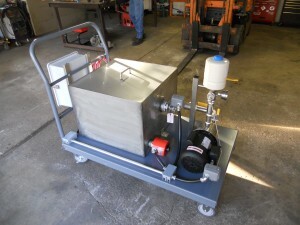 Abrasive slurry high pressure metering pump system with VFDs and redundant online spare pump. 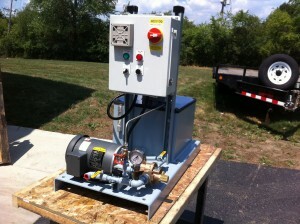 Wanner D15 high pressure 2500psi pump system with actuated valve and stainless steel piping. 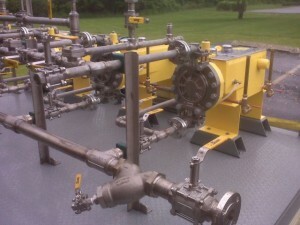 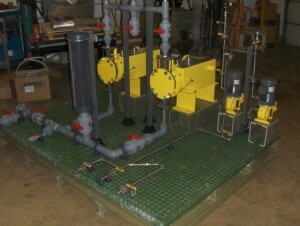 Explosion proof, magnetically driven duplex pump system for tank recirculation at a refinery. 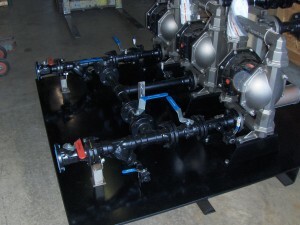 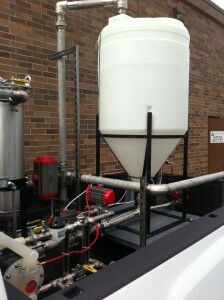 Antifoam tank system: Mixed antifoam and water mixture to spray nozzles at pharmaceutical company. 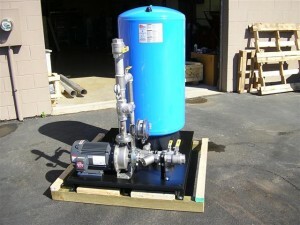 Diaphragm pump packages for totes, 55gal drums, 5gallon pale or any custom size. 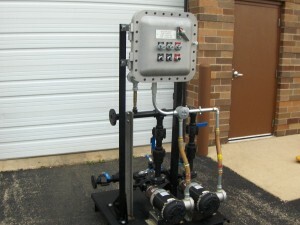 Duplex stainless steel diaphragm pump system with online spare for refinery. 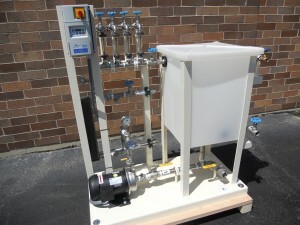 Batch system for mixing chemicals and water with PLC control panel, actuated valves and load cell. 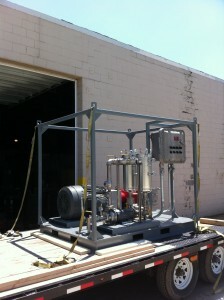 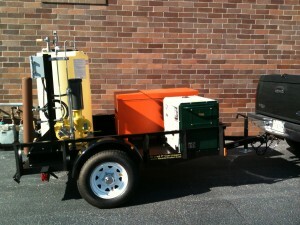 Trailer mounted chemical feed system with tank, metering pump, diesel engine, control panel, and stainless piping. 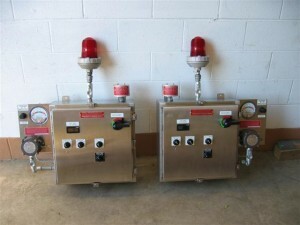 Constant level tank system with PLC control panel, level transmitter, and duplex pump system. 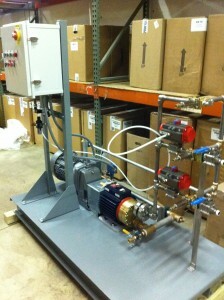 Stainless steel pressure control system with bladder tank, mercoid switch, and Ebara stainless steel pump. 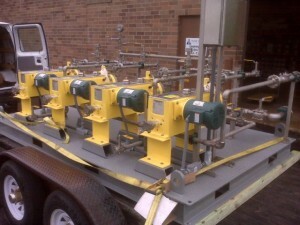 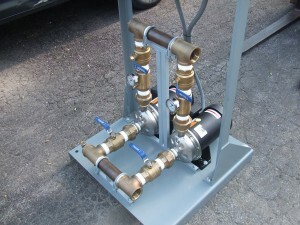 Commercial high rise building booster pump system. 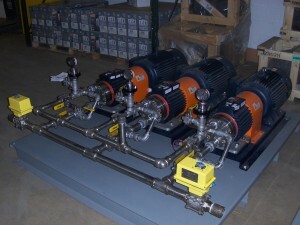 Duplex constant pressure VFD booster end suction pump system in stainless steel for power plant. 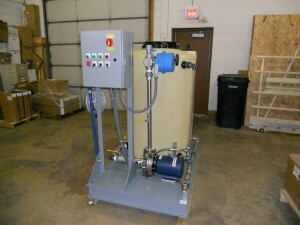 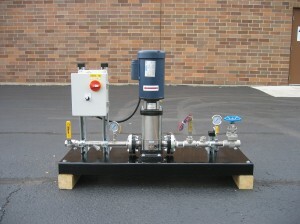 Single phase stainless steel pressure boost system with flow switch, vertical multistage pump, and NEMA 4 panel. 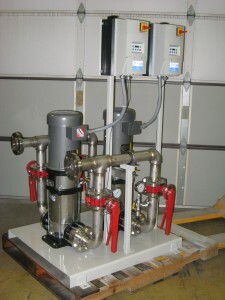 Duplex constant pressure VFD booster vertical pump system in stainless steel for power plant. 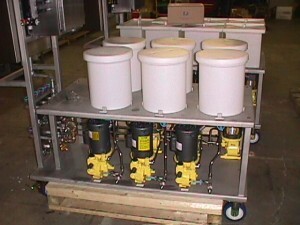 Food plant bearing cooler system with heat exchanger, VFD, tank, and flow indicators. 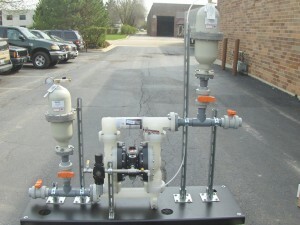 Ebara booster custom sized to fit in confined space under tank. 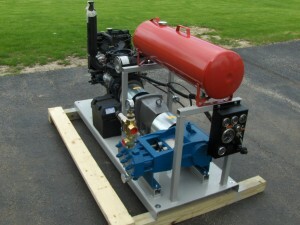 Diesel driven, high pressure pump system with fuel tank, starter panel, and automatic cut-off switch. 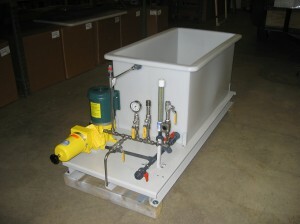 Break tank system on galvanized base. 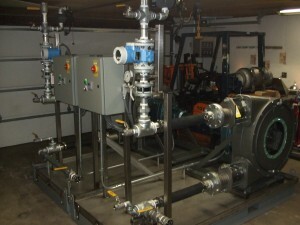 Closed-loop oil circulation system with tank, level control, and gear pump. 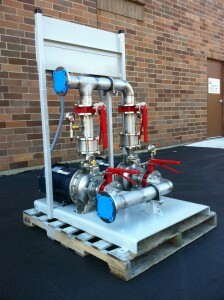 High pressure stainless steel pump system rated at 5000 psi. 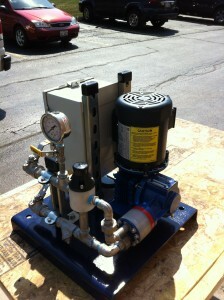 NEMA 7 explosion proof rated with feed pump and duplex filters. 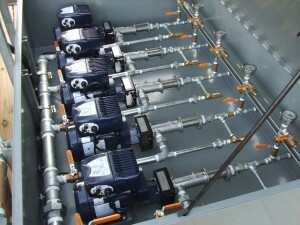 Lime Slurry duplex peristaltic pump system with flow meters and stainless steel piping. 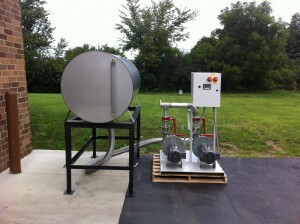 Custom insulated, dual wall, stainless steel tank with integrated mix pump and level control. 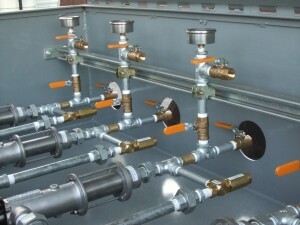 Power plant chemical feed system with high capacity metering pumps, stainless steel welded piping with provisions for installing piping insulation in the field. 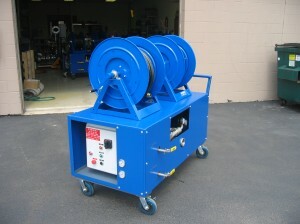 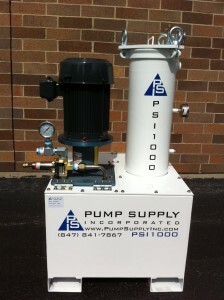 2000psi chemical feel pump system with low profile tank. 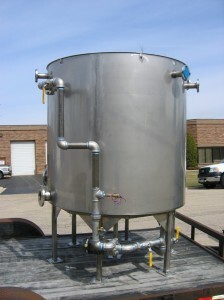 Chemical feed batch system with stainless steel tank, piping, level control and containment base for power plant. 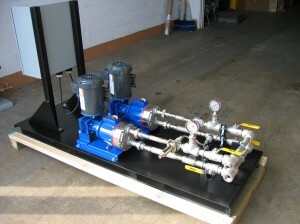 Portable cart mounted metering pump dispensing system with six pumps and tanks at food plant. 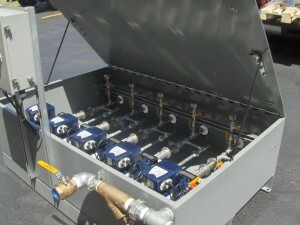 Intrinsically safe control panels with nitrogen purge support system. 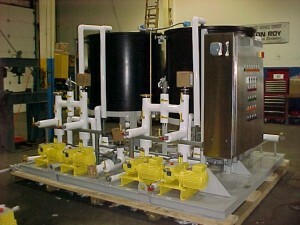 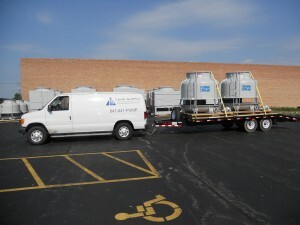 Condensate return tank system with duplex low npsh pumps. 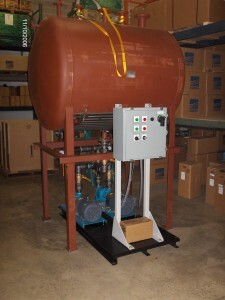 Portable cart mounted sanitary stainless steel tank system with flow meter, single phase panel, level control, flow meter, recirculation line and provision for immersion heater. 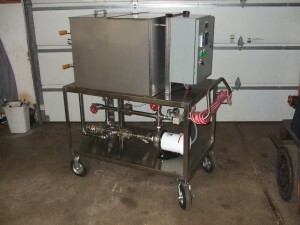 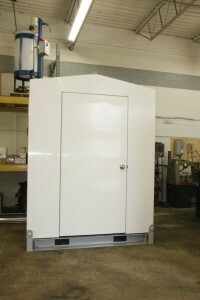 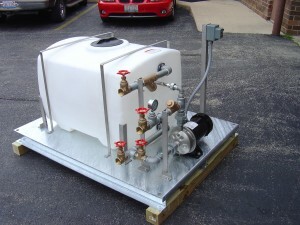 115v portable cart mounted stainless steel tank system with heater, panel, level control, and bladder tank. 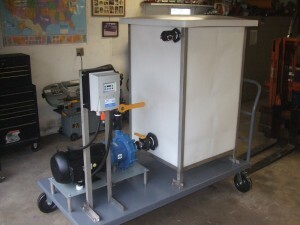 Sanitary pump cart with tri-clamp fittings, filter, flow switch and NEMA 4X panel. 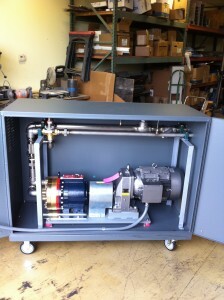 High pressure pump system with gear reducer, cabinet enclosure, stainless steel piping and NEMA 4 panel. 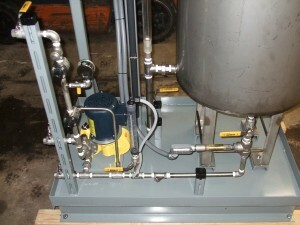 Chemical feed system installed in heated fiberglass building. 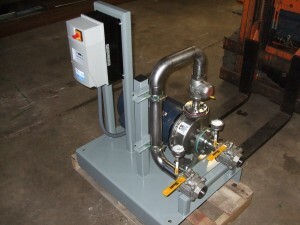 Progressive cavity oil metering pump system in enclosed cabinet for dispensing oil at steel plant. 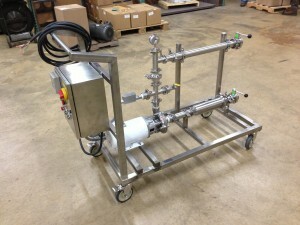 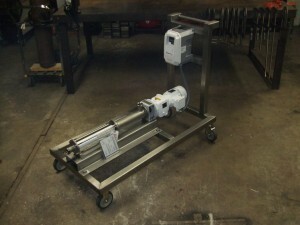 Progressive cavity hopper feed pump system with load cell, flow meter, and all stainless components.